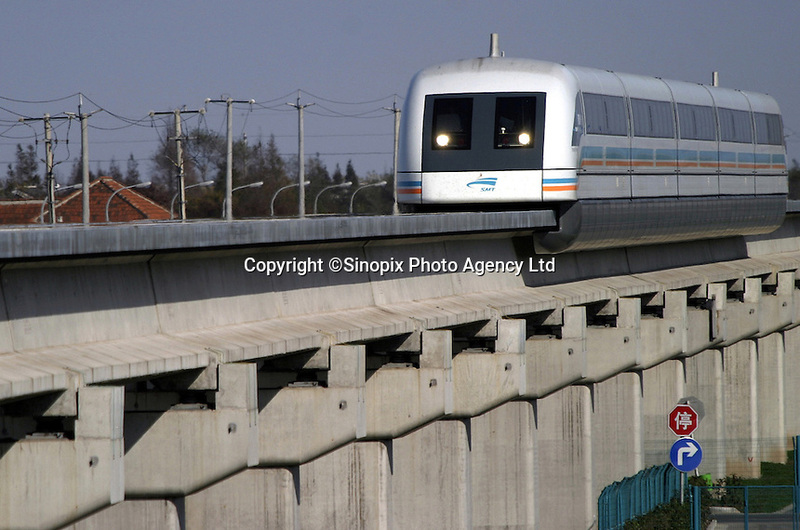 QS031123Shanghai001 20031123 SHANGHAI, CHINA: A Shanghai Transrapid magnetic levitation train speeds along its tracks in Shanghai, China 23 November 2003. Able to reach a top speed of 430 kilometers per hour, the Transrapid completes the 30 kilometers journey between the Pudong International Airport and the Longyang Metro Station in just over 7 minutes. Still under its testing phase and carrying tourists on a wekend-only basis, the line will be in full operation early next year and expects to carry 10 million passengers per year by 2005.